It is the last half an hour before the Christmas ends. The super lazy me, and the super busy weekend that it was * Considering that it was my mother's birthday today and I sorta asked her friend to organize a BBQ, while I spent time with my darling BF*, I could not write this post earlier. But never late than never. 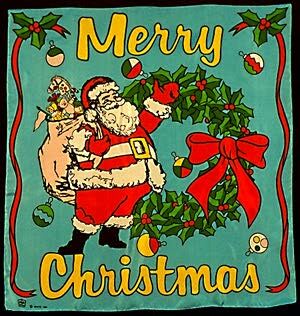 Here is wishing all of you A very Merry Christmas! May God bless you all with lots of love, peace and happiness :). And, even though I am not a kid, and I did not write you a wish list, you still made this Christmas really special for me. I have always loved Christmas, and it is very special because it is my mum's birthday, but this year, playing Santa *The secret santa in office, where I played santa to one of my colleagues and made the whole lot of effort to make the card and pack the gifts*, I realised the joy of giving. Of making people go all, WOW! at the gifts, wishes and pleasant surprises that are given to them. I now, understand why you are such a jolly fellow. For so many years, there have been debates about whether you are real or you are not, but I have always believed in you, and have never been let down. Each Christmas, there is a present waiting for me, to make me smile. And the best part is, that, that present may not be a materialistic thing, but, it is there. Just for me. Please convey my BELATED MANY MANY HAPPY RETURNS OF THE DAY to your mother. Merry Christmas to you all too. Very sensible letter and I am sure Santa will grant you whatever you wish for. You played Secret Santa too..?? Awwww.. it is such a lovely game.. I mean, seriously man. It was the first time I exchanged gifts with my fellows on Christmas.. And I so so so fell in love with the game. Every morning, there was something to look forward to.. And of course, it was this surprise element that actually made the game fun.. Imagine when you are super busy and suddenly one of the housekeeping staffs comes in with your gift and everybody forgets what work they had been doing and simply crowd around you, asking, "Kya mila?".. That is a good thought.....the present not being materialistic. Very few think of it that way. All want to know "what is there for me under the tree?" The fact is that all the small blessings in life accumulate for the general happiness.